The Skinny: A Chinese woman rescued from slavery comes between a fellow countrymen and a white cowboy in this remarkable Western. Writer/director/producer James Clavell crafts an intelligent exploration of racism and hypocisy in the Old West with an involving plot and flawed but sympathetic characters. While James Clavell may be better known for his Asian-themed novels Shogun, Tai Pan and King Rat, the author actually had a career in Hollywood prior to his more famous literary successes. Few people remember that he penned the screenplay for the 1958 horror classic The Fly and later co-wrote The Great Escape in 1963. But he wasn’t just a screenwriter. Between those two high-profile gigs, he wrote, produced and directed two movies, Five Gates to Hell (1959) and Walk Like a Dragon (1960). While the former project was a war film (Clavell himself was a P.O.W. during World War II), the latter was a Western, albeit one with an unsurprisingly “Eastern” theme. Set in 1870s California, Walk Like a Dragon centers on the conflict between a racially intolerant white cowboy and a Chinese immigrant with a huge chip on his shoulder. The spark that causes the flame of hatred between them is nothing new: it’s a beautiful woman. Kim Sung (Nobu McCarthy) catches the immediate attention of Lincoln “Linc” Bartlett (Jack Lord) when he stumbles upon a Chinese slave auction. The cowboy buys her but isn’t interested in keeping her for himself. He tells her she’s free to go, but as a non-citizen with no connections in California, Kim Sung asks to stay with him. After some initial hesitation, Linc allows her to accompany him back to his hometown of Jericho, California. Hitching a ride with the two of them is Cheng Lu (James Shigeta), a recent immigrant from China who has come to work for his uncle (Benson Fong) in a laundry also located in Jericho. Disgusted by the racism he encounters, Cheng Lu refuses to kowtow to any white man, no matter the cost. However, when he offers to buy Kim Sung off of Linc, the cowpoke is repulsed, and a deep rift erupts between the two. Meanwhile, Linc and Kim start to develop feelings for each other, a turn of events that draws the ire of not only Jericho’s bigoted townsfolk, but of Cheng Lu himself. Since the film is set in the Old West, a final gun duel between the two is all but assured, although things play out very differently than your typical Western. 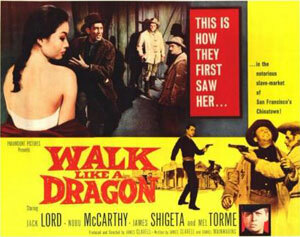 Walk Like a Dragon benefits considerably from its strong cast, with no one playing a wholly right-minded character. Future Hawaii Five-O star Jack Lord makes for a charismatic leading man, but he’s not exactly the cowboy with the white hat. Linc may warm up to Kim, but he’s also disgusted by Cheng Lu, even resorting to racist epithets during more than one of their encounters. We may feel for the guy, but his tolerance for others different from himself is clearly inconsistent. After all, he’s not particularly concerned about what happens to the other girls up for sale at the auction, and he has some selfish thoughts when he comes face-to-face with what life might be like if he marries Kim. Hawaii-born and raised actor James Shigeta successfully follows up his starring debut in The Crimson Kimono (1959) as Cheng Lu, a character boiling with rage upon learning that he’s expected to play the subservient dope in order to survive. Through his discussions with Benson Fong’s character, the film posits that the phony, exaggerated Chinese accents we see in Hollywood films are just that – phony. In the universe of Walk Like a Dragon, Chinese immigrants purposely adopt “chop-chop, me no savvy” English grammar in order to pacify their white oppressors. While Cheng Lu may be absolutely right in his principled refusal to bow to any man, he is also arrogant and retrograde in his views toward women. Like Linc Bartlett, Cheng Lu is anything but a role model. Rounding out the main cast is Nobu McCarthy, who acquits herself well as Kim Sung, the Chinese slave girl who ends up the object of the film’s love triangle, but who only seems to have eyes for her white savior. While McCarthy conveys an irresistible sweetness, there’s a real weight lacking to her performance. It may well be a script issue, as she’s more or less a pawn in the film’s central masculine power struggle. Spicing up the mix is the inclusion of singer/actor Mel Torme as the Deacon. When Cheng Lu encounters problems with the locals, he hires Torme’s enigmatic, Bible-quoting gunslinger to teach him how to be a quick-draw artist, hoping to learn how to gun down any challenger in seconds. Dressed entirely in black, Torme radiates an amazing screen presence, something one might not expect considering his more comedic TV appearances in Night Court and Seinfeld later in life. Unsurprisingly, Torme even sings the title track. The film’s central concern seems to hinge on Christian hypocrisy, especially as it pertains to racism. Several characters who profess Christian charity are less charitable when it comes to having a Chinese girl live among them. Some of these characters are redeemed; others are not. For instance, Linc lives with his mother (Josephine Hutchinson), who initially rejects Kim Sung as a “heathen.” However, her racism soon softens when she begins to see Kim as a real person. Not so kind towards Kim are the racist townsfolk who, aside from a compassionate preacher, are repulsed by the fact that a so-called heathen would dare step foot in their church. Clavell puts his characters through the wringer in an effort to explore hard truths about racism, interracial relationships and mixed race children. Considering the fact that the last miscegenation laws weren’t repealed until 1967 - some six years after the release of Walk Like a Dragon - one can see how its subject matter likely wasn’t received as a quaint exposé of a different time. This is a film that had some relevancy to its contemporary moment. Notes:  There have been rumors suggesting that Clavell filmed two different endings for the film, although the alternate conclusion has never surfaced.  Walk Like a Dragon is currently unavailable on DVD, but at the time of this writing, it is available on Netflix Instant.